Plus receive game updates and more gifts over time! 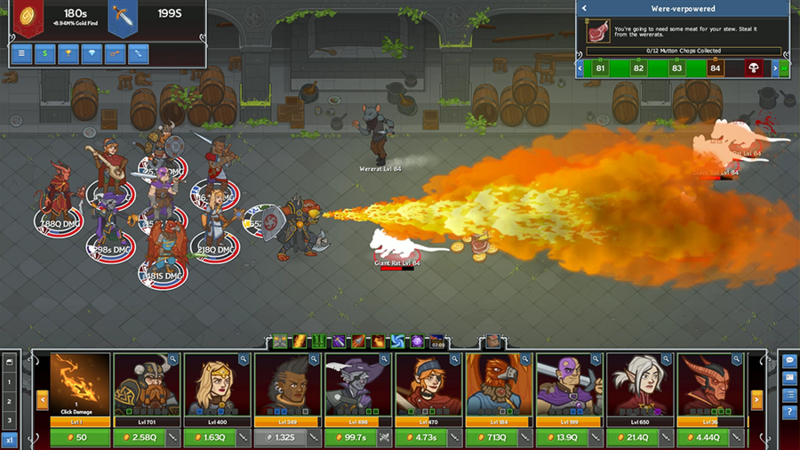 Idle Champions of the Forgotten Realms is an official Dungeons & Dragons strategy management game. 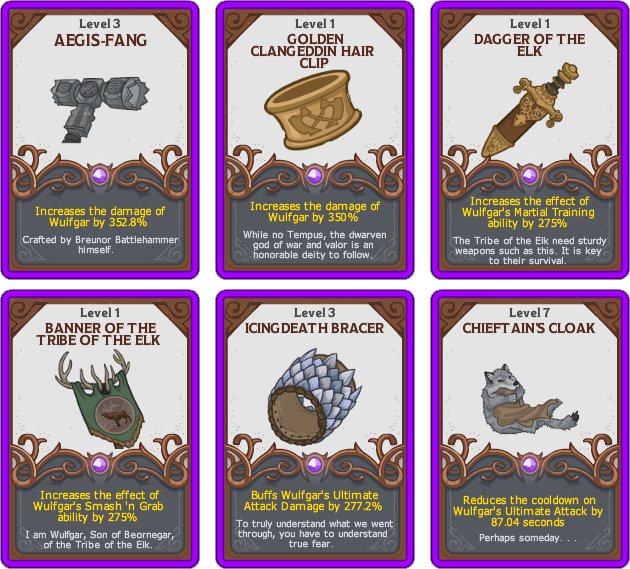 Collect renowned Champions from the world of Dungeons & Dragons. Master Formation Strategy to maximize each Champion's special abilities. Regular updates with new official Dungeons & Dragons adventures. Complete events to unlock new Champions and gear. Tags: idle, champions, early, access, event, brightswords, wulfgar. Our Champions have arrived in the quaint town of Longsaddle amidst the Brightswords festivities, hoping for some much-needed rest after a full year of touring Chult and the Sword Coast. However, they arrive to find Longsaddle under siege! 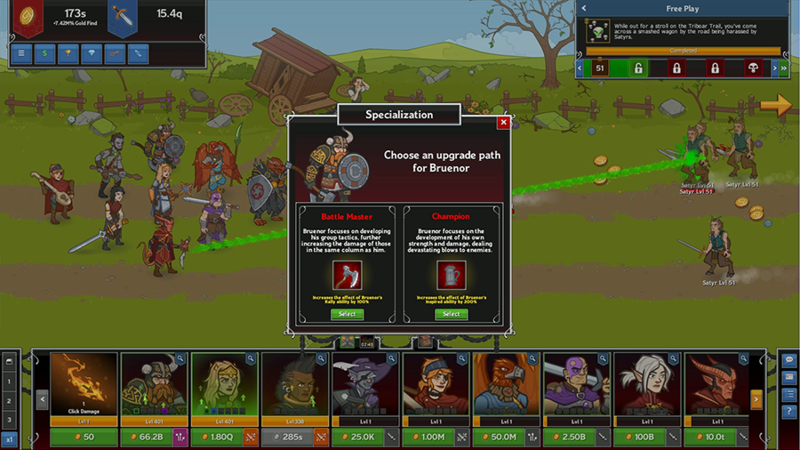 Brightswords is our seventeenth limited-time event for Idle Champions of the Forgotten Realms, and the final event of Year One. This event runs until Monday, September 24th at 12:00pm Pacific, and introduces Wulfgar, Human Barbarian and the final member of the Companions of the Hall! Wulfgar started his life in the north as the flag bearer of the barbarian Tribe of the Elk. He was bested in the assault on Ten-Towns by Bruenor Battlehammer, who decided his punishment would be five years and a day of service. Bruenor grew to love the tall barbarian, eventually seeing him as an adopted son. At the end of his service, Drizzt Do'Urden to taught Wulfgar the ways of combat and Bruenor crafted for him a mighty warhammer, named Aegis-fang. This magical warhammer bears the symbols of three of the Dwarven Gods: Moradin, Clangeddin, and Dumathoin. It is specifically attuned to Wulfgar and magically returns to his hand upon telepathic command. Wulfgar deals AOE damage that stuns and deals additional damage to armored and stunned enemies. He has additional abilities for each other Companion of the Hall present. When you want to add Wulfgar, Son of Beornegar to your party, you can swap him with Tyril or Barrowin (Slot 10). 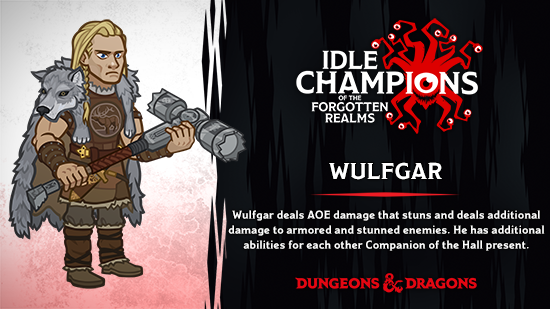 For more information about our latest Champion, check out the Idle Champion Spotlight: Wulfgar dev blog! Little Eyes are Lurking — A pair of Quasits have infiltrated your party, taking up two slots in the formation and causing chaos, making it difficult to work as a team. Every 25 areas they switch positions. Father and Son — Wulfgar and Bruenor have set off alone, on an adventure to catch up after some lost time. Only Bruenor and Wulfgar are available, and both start in your formation. 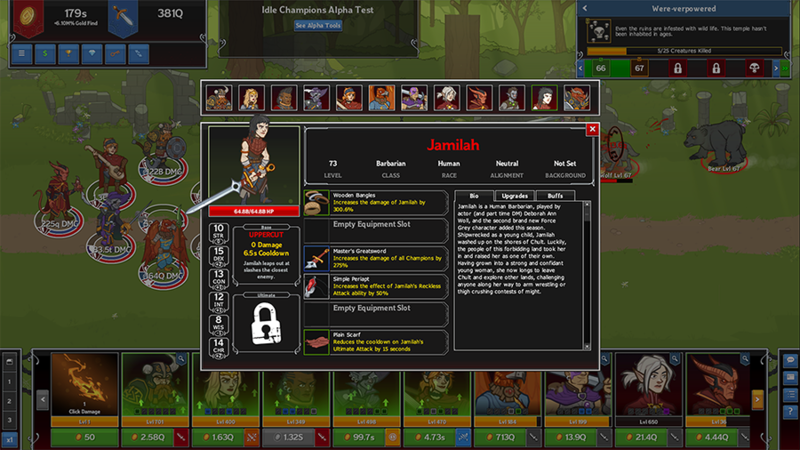 Their damage and cooldowns are dramatically improved. Lolth's Domain — All Drow have the blessing of Lolth. Enemies gain armor and bosses gain additional armor. Added the Brightswords event, our seventeenth limited-time campaign event! The event runs until Monday, September 24th at 12:00pm PDT. Added a new Champion: Wulfgar, the Human Barbarian. Added a new event Divine Favor: Tempus' Favor. See the in-game Change Log for more information! Tags: idle, champions, update, event, Brightswords, Wulfgar, spotlight, Companions, Companion. Welcome to our latest Champion Spotlight design blog! Today, we're going to go into detail on our newest Champion: Wulfgar, Son of Beornegar - A Human Barbarian, and a member of the Companions of the Hall! Wulfgar will be available in our final Year One Event, Brightswords, launching TOMORROW (September 12th)! I hope this blog will give you all you need to know about our latest Champion. Wulfgar is unlocked by playing Brightswords, a limited-time event launching on September 12th and running until September 24th. Once you unlock Wulfgar, he swaps with Tyril or Barrowin. Wulfgar is the final piece to the Companions of the Hall team that started with Bruenor in the base game, and continued with the introduction of Catti-brie and Regis as event champions, and Drizzt as an evergreen champion. With Wulfgar as the final Event Champion of Year One, the Companions of the Hall - made famous through R.A. Salvatore's bestselling Legend of Drizzt series - is now complete! Wulfgar started his life in the north as the flag bearer of the barbarian Tribe of the Elk. He was bested in the assault on Ten-Towns by Bruenor Battlehammer, who decided his punishment would be five years and a day of service. Bruenor grew to love the tall barbarian, eventually seeing him as an adopted son. At the end of his service, Drizzt Do'Urden taught Wulfgar the ways of combat and Bruenor crafted for him a mighty warhammer, named Aegis-fang. This magical warhammer bears the symbols of three of the Dwarven Gods: Moradin, Clangeddin, and Dumathoin. It is specifically attuned to Wulfgar and magically returns to his hand upon telepathic command. We approached Wulfgar as the final piece of the Companions of the Hall formation. We wanted to make sure that he was strong on his own, but when placed with the Companions, the team shines. Martial Training: We began by looking at his backstory and how he would want to work with all of the companions. Immediately, we landed on his Martial Training ability - the idea that since Drizzt taught him how to fight, he and Drizzt have been able play off each other and capitalize on their combat strategies. Whenever one of them kills an enemy, both of them increase their damage for 10 seconds. As a note, this is a one-time boost that lasts for 10 seconds. If the bonus is already in place and either of them get another kill, it just resets the countdown to 10 seconds. Barbarian Smash: Wulfgar's base attack is second to none. He jumps out and smashes the nearest GROUP of enemies with a chance to stun them all for 5 seconds. Stuck at your wall and your tank can't take all the attacks? Bring Wulfgar in to help you clear them out. As we continue to talk about his abilities, you'll notice a lot of them deal with stunned enemies. Wulfgar is your expert at stunning, but his abilities will also work against enemies stunned by other Champions. He's like bringing the Xanathar to a Binwin fight. Oh? Too soon? Sorry. . .
Companion Abilities: Everyone knows that the adventuring party is always strongest when they are together, right? Well, we wanted to hammer that idea home with Wulfgar, who has an ability tied to each Companion. If they are in the formation, the ability is active. If they aren't, it isn't. Bruenor: Increases the effect of Bruenor's Rally ability for each stunned enemy. Regis: Stunned enemies drop more gold if Regis is in the formation. Catti-brie: Increases the chance of Catti-brie's critical hit ability against stunned enemies. Drizzt: Because Martial Training wasn't enough Drizzt/Wulfgar buddy cop fun, we also added an ability that increases Drizzt's damage against stunned enemies. Smash 'n Grab: Wulfgar wields a GIANT magical warhammer that Bruenor created and called Aegis-fang. Not only does it magically reappear in his hand after he throws it, Wulfgar really loves smashing things with it. With his Smash 'n Grab ability, Wulfgar deals more damage against armored enemies. If he does enough damage with his attack to remove a chunk of the hit-based armor, he also increases the damage of all Champions for 10 seconds. This will hopefully help a few more Champions get in on the armor-breaking fun! Flag Bearer: Wulfgar's damage is increased against stunned enemies. When he stuns an already stunned enemy, all Companion abilities are buffed for the duration of the stun. Acererak should really have thought twice before coming to this plane. Moradin's Will: Choosing Moradin, the dwarven god of creation, will increase the duration of Wulfgar's stuns from his Barbarian Smash basic attack by 2 seconds. 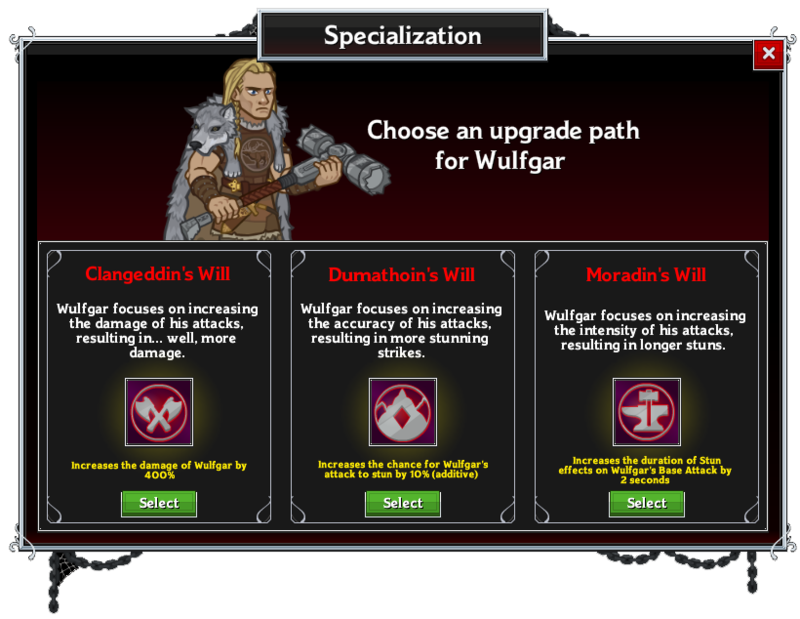 Each of these specializations will help you augment how Wulfgar (and the rest of the Companions function in your formation. Try them all out to see which one works best on any given adventure. 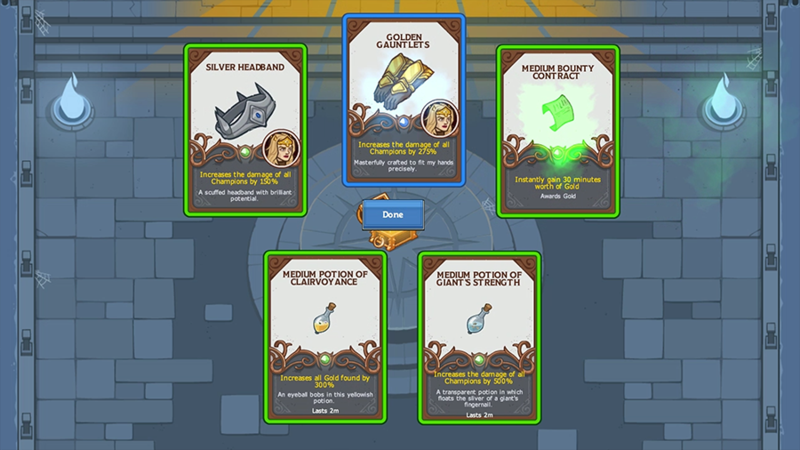 Don't forget, you can also change your choice mid-game by using a Potion of Specialization. Aegis-fang is unleashed with Wulfgar's ultimate attack. He throws Aegis-fang at the most distant enemy, dealing damage to and stunning all enemies in that line for 10 seconds. 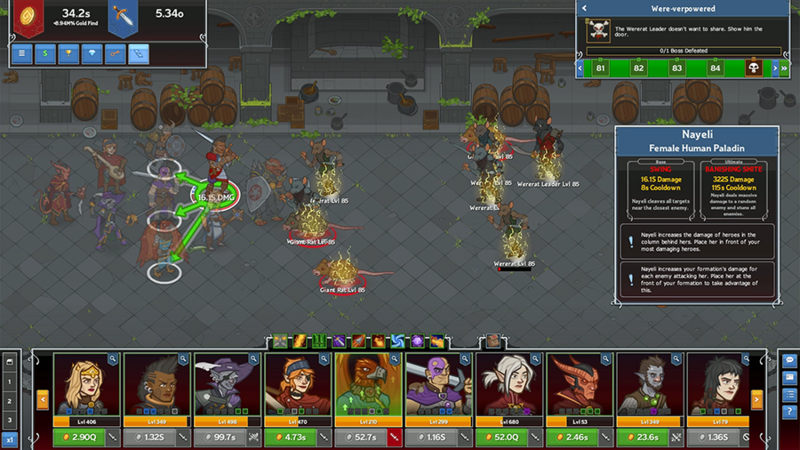 Wulfgar's warhammer increases his damage. Wulfgar's dwarven hair clip shows the weight of his dwarven upbringing, increasing his damage. Wulfgar's Dagger increases the effect of Martial Training ability. Wulfgar's Tribe of the Elk banner increases the effect of his Smash 'n Grab ability. The trinkets Wulfgar collected from his battle against Icingdeath increase the damage of his Ultimate Attack. Wulfgar's Wolf Cloak reduces the cooldown on his Ultimate Attack. Wulfgar is the final piece to the Companions of the Hall puzzle. He focuses on stunning enemies he can't outright kill, and buffs the rest of the Companions of the Hall if he (or anyone else) stuns enemies. We're looking forward to seeing what new formations pop up now that he has been introduced! We'll be watching the discussion online and on discord to see how well he's received, so let us know what you think on Facebook, Twitter, or on the official Discord! © 2019 Codename Entertainment Inc. All Rights Reserved.